Today I'll show you the whole room and then tomorrow I'll post in more detail about the furniture. Anyone can do this!! I think the paneling on the back wall really made a difference. Thank you Michael for being my carpenter! This is probably one of my favorite things in the room. I was inspired by two pictures and one of them had this coral. I NEVER thought I'd find it and then I walked into Marshall's, the clouds parted, the sun shone down, and the angels were singing. On the bottom shelf of the coastal decor was MY coral!!!! The shelf I found for half-off at Garden Ridge. So as you can see, the room went from dark to light. From out dated furniture to repurposed antiques. I think this picture looks like one of my boys' "Can you spot the difference?" books... Stay tuned for tomorrow's post on the furniture! 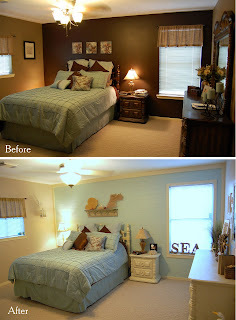 Your bedroom looks so pretty! I love the new lighter color! Great job on the transformation! Love how it lighten up the room! Great re-do!